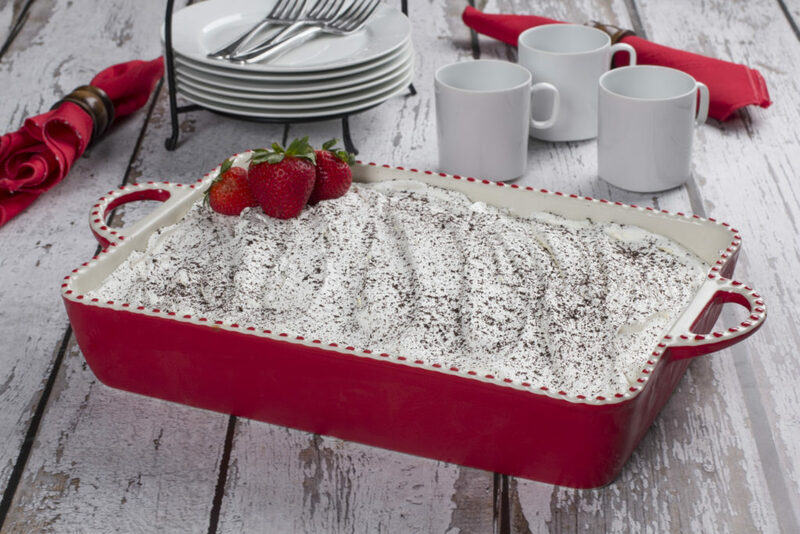 Today’s prize is: (1) 9″x13″ Open Stoneware Baker in Cherry Pie Red (pictured) and (1) 8″x8″ Open Stoneware Baker in Cherry Pie Red (not pictured) from the Mr. Food Test Kitchen’s “Everyday-Basic Collection.” These baking dishes are microwave-safe, dishwasher-safe, and oven-safe. Plus, don’t miss out! All bakeware and kitchen essentials from the Mr. Food Test Kitchen are on sale at 33% Off now through December 25th – it’s our gift to you! Just enter code HOLIDAYSALE at checkout! There’s more than presents to look forward to on Christmas – there’s usually a yummy breakfast too! If you want to surprise your family with a tasty breakfast casserole on Christmas, you’ll love this collection of Breakfast Casseroles for Christmas! What do you normally eat for breakfast on Christmas morning? Today is the ninth day of our 12 Days of Christmas Giveaways. You can enter each day to win the prize of the day. Contest rules and how to enter are below. You have until tonight, Tuesday, December 13, 2016, at 11:59p ET to leave your comment on this blog post and on the recipe. Comments posted after that will not be counted. We usually go to our daughter and son-in-law’s home for brunch which often consists of hash brown casserole, pancakes, eggs and Christmas sausage locally made. The recipe for Cherry Chocolate Chia looks like a great way for busy people to get all the nutrients they need to start the day. I make a big batch of homemade cinnamon rolls! We also have hot cocoa and egg nog to go with them while we watch the parade! A one dish number like strata or crustless quiche. Apropo for the prize. We have homemade cinnamon rolls right after opening our stockings. Christmas morning breakfast is a light affair at my home; as a late Christmas dinner at around 2 PM is coming up at my sister. Therefore, it is a great cup of coffee, orange juice and the best cinnamon rolls you will ever taste. Hot cereal and toast so I have room for the Christmas meal. Panettone, eggs, bacon or ham and plenty of coffee and orange juice then maybe some fruit. We always have a sausage and egg breakfast casserole right after opening gifts! Congratulations, Janelle! You are the winner of the ninth day’s prize! We’ll be sending you an email shortly, so you can claim your prize. Please respond as soon as possible, so we can send it your way. We have a huge Christmas brunch before opening presents! We make a breakfast casserole, sausage balls, monkey bread, toasted mini bagels, and put a spread of fruit on the table. On Christmas morning we always have homemade cinnamon rolls for breakfast! We usually do pancakes, eggs, and bacon. I usually eat either pancakes or cinnamon rolls for Christmas morning. We have eggs, bacon or sausage, homemade cinnamon rolls or monkey bread and mimosas. Lots of yumminess! We make a HUGE Christmas morning breakfast. Bacon and sausage, eggs, ham, pancakes, hash browns…the works!! We usually have pancakes or waffles, scrambled eggs and hash browns. This bakeware is so pretty Mr. Food! I make breakfast of stuffed French toast with strawberry and blueberries with a side of ham. Yum! – Merry Christmas! Whatever I decide to make… may be a breakfast quiche using my Wolfgang Puck mini pie maker… time to dust it off? My husband either makes eggnog waffles or banana waffles or I make a leek spinach quiche with bacon. We always have homemade cinnamon and caramel rolls! Good strong coffee, hot cocoa and fruit! I usually let the kids ( yeah right lol they are 20, 18, and 16 ) decide on what they want, whether it be french toast, homemade pancakes from scratch or the whole eggs, bacon etc.thing. then i put my own holiday twist on it to surprise them.i also make some kind of scones or cinnamon buns type thing to go with it all. We don’t usually eat anything special, just something quick because we are always in a hurry to get to my sister’s house in time. We usually have cinnamon rolls! We don’t make much for breakfast as we are getting ready for dinner. We usually have a quick breakfast of left overs from our Christmas eve party and then we are off to my in-laws for Christmas day. 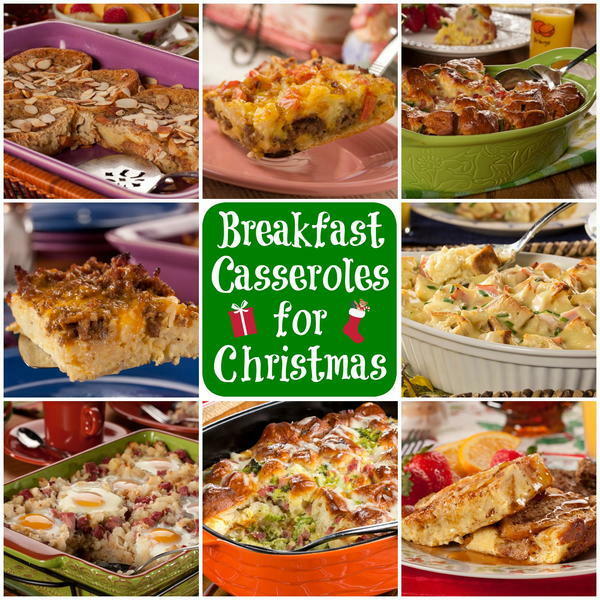 I would love to try some of the breakfast casseroles this Christmas though. We don’t have a Christmas morning breakfast tradition yet So normally it’s cereal, coffee, just normal stuff. I eat a breakfast casserole and country ham and eggs with all the fixings When all my family was still home . But know I’ll eat me a breakfast casserole it will be easier to make just for me . Thank you for the wonderful 12 days Christmas giveaway . God bless and Merry Christmas. Will be keeping that dish busy if I win! Love it! Normally nothing. I save my appetite for a wonderful Christmas meal. We have pancakes, eggs, & sausage links! On Christmas morning, we always make a nice breakfast usually we make cinnamon rolls, eggs, french toast, bacon and sausage and have coffee, tea, juice or whatever anyone else wants to drink. 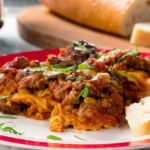 It’s always festive around our house and we do make breakfast casseroles as well from time to time and the family just loves them. This dish would sure come in handy for making them. It’s likely our biggest breakfast of the year, as we’re not big breakfast fans around here… but we’ll whip up some cheesy eggs, pancakes, bacon, sausage, biscuits, gravy, etc… the works… and will munch on it pretty much all morning long. IT DEPENDS….. WE USUALLY HAVE A FAMILY BRUNCH SO I JUST TAKE A NIBBLE OF EVERYTHING! We usually have a big breakfast. Biscuits and gravy, yellow corn grits, eggs, bacon, and gingerbread pancakes. This year I will be trying a breakfast sausage bread, wish me luck! I have a make-ahead Christmas morning casserole that I pop in the oven when we wake up. We normally have eggs and chocolate chip pancakes! We usually eat waffles or pancakes with bacon! We usually have overnight french toast and an egg casserole with sausage and bacon plus sweet cinnamon rolls. Mimosa’s for the adults and hot chocolate for the kids! Christmas music and gifts following a big hearty breakfast. a big spread that includes choices like pancakes, French toast, waffles, bacon, sausage, cinnamon rolls with lots of glaze, quiche, eggs Benedict, fresh fruit and plenty of coffee! We usually have french toast for Christmas morning. Cinnamon rolls , hot chocolate or hot spiced tea. 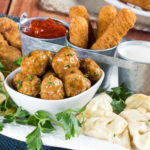 Sausage Balls plus some kind of Breakfast Casserole. Thanks for the above recipes. Egg Nog French Toast! So yummy, can’t wait! Broccoli, mushroom and cheese Strata. Happy Holidays! Grits, scrambled eggs, bacon and biscuits at Grandma’s. Breakfast casserole made with ham, mushrooms & zucchini, and cinnamon rolls for something sweet! My family usually makes Santa Smoothies! (It’s a berry-filled smoothie – great for the holidays and breakfast!). A cinnamon raisin bagel with bacon and melted provolone and sharp cheddar cheese. Also a tiny bowl of syrup to dip it in on the side and of course some fresh brewed coffee, yummy! I have made for Christmas morning breakfast, bread shaped like Christmas trees, for over 50 years. I found the recipe and started making it so my sons would sit down, eat the bread and have juice before they could see what Santa brought. I also give my neighbors and friends this decorated bread each year. I frost it with green icing and add colored sprinkles to each. Candy and Oranges from all of our Christmas Stockings! We have a big meal later in the day with ham, mac n cheese….But…so that we can “play” with our toys we just snack down on the Stocking food! Crescent roll casserole with eggs and cheese and sausage! We have a brunch – eggs, sausage, french toast, pierogis, and all types of other goodies. We normally have a quick breakfast because we have such a large lunch. A sausage and egg casserole that I make. My Mom will also make sausage and biscuits. We usually have cinnamon rolls. Just cereal! Don’t want to fill up before the big feast! We love French Toast, sausages, bacon, eggs and fruit. I am alone on Christmas morning so I treat myself to fresh farm poached eggs on toast and apple cider. I then savor my coffee with pumpkin spice creamer. We generally have pancakes, eggs, bacon, sausage and orange juice on Christmas morning. we have eggs and some kind of potatoes every day. I like to have ham and cheese egg casserole, or else go to our favorite buffet for custom omelets. I don’t have anything for Christmas morning as I would still be full when it came dinner time. I don’t like to feel stuffed so I don’t eat breaksfast. However if I have company I will fix them either French toast, cinnamon rolls or pancakes. It is their choice. Biscuits and gravy, eggs, and bacon. We always have cinnamon rolls! same as any other morning-choice of cold cereal or green drink. Easy. We don’t usually have too much for Christmas breakfast. Just a bowl of cereal or oatmeal. Since a big meal is awaiting us later in the day we don’t like to fill up too much. The 13 X 9 and 8 X 8 bakers look great. Best of luck to everyone. Merry Christmas!!! French Toast and Fresh Berries! I’ve been making baked blueberry french toast for 20+ years. It’s definitely a tradition I love. We usually have a breakfast buffet including eggs, bacon, ham, sausage, biscuits, biscuits and gravy, hash brown casserole, etc. My brother started the tradition with all the family going to his house for breakfast and to see the kids with their toys. Then it went to my brother and then to me. Now my daughter is continuing the tradition. I make a coffee cake with a cranberry/nut topping, eggs, fruit, and turkey sausage. We have breakfast at our daughter and son in laws home. We have eggs,hash browns,bacon,toast,French toast casserole and pastries. We normally have donuts and coffee Christmas morning with my husband’s family. I love cinnamon rolls too. I make a cranberry coffee cake. We eat homemade cinnamon rolls when we first get up, later in the morning I make bacon and eggs or some sort of egg casserole. I make a luscious french toast casserole! On Christmas morning, we eat homemade Cinnamon Rolls along with a bacon, eggs and hashbrowns and sometimes sausage too. Waffles and breakfast sausage links. love my hot chocolate and oatmeal on christmas morning! Chicken noodle soup with orange juice, then I go to my daughter’s to visit with her family and enjoy her fantastic cooking!! For Christmas morning we have one of the following: waffles or pancakes with chocolate chips and or blueberries with syrup. We will also have bacon or sausages, eggs and grits. I usually don’t eat breakfast on Christmas morning. I wait and feast on the big meal of the day! I make a tater tot breakfast casserole. Just brown ground sausage, drain, mix 12 eggs with 1/2 cup milk, salt and pepper, then pour over drained sausage. Layer tater tots on top, top with cheddar cheese and bake for 45-55 mins on 375. Top with sausage gravy, hot sauce, or whatever you like. We don’t normally eat breakfast on Christmas morning. We usually save room to eat our dinner. Usually a “granny style” ham and whatever else we have put together. Sometimes mashed potatoes and stuffing. Ohers we have just done the ham and rolls and made sandwiches. My mother-in-law makes a ring of cinnamon rolls, yummy!! Honestly we don’t get crazy with breakfast on Christmas morning. Usually oatmeal and hot chocolate. Christmas breakfast consists of a version of Lazy Chili Rellenos only I add breakfast sausage and top with Tater Tots and sharp cheddar cheese. I make it the night before and it would be beautiful in one of these red casserole dishes! We have homemade cinnamon rolls and scrambled eggs. I like that some of the casseroles can be made in advance. Pumpkin pancakes and hot coco. Whatever the first p;person that gets up makes, usually some kind of muffins, thanks for opportunity, LOVE TO WIN!! I make Cinnamon Monkey Bread for Christmas morning. Paired with fruit, it’s a light breakfast before the big meal ! On Christmas morning I always make waffles and bacon! Cinnamon rolls are our go to breakfast on Christmas. Onion and cheese egg white omelette with corned beef hash. There are some great looking dishes in this group. Homemade cinnamon rolls and scrabbled eggs by the fire. I never thought of a French Toast casserole! I used to make biscuits and gravy for Christmas morning when my children were little. I also had the bread maker set to bake overnight so they would wake up to cinnamon bread smell except the machine made so much noise it woke them up early!! But it’s the memories that count! !